Programs to develop high-potential employees and corporate leaders. The firms with these strategies posted stronger performances since 2008. Deloitte found that the September, 2008, Lehman Brothers bankruptcy and financial sector losses that led to a worldwide recession was an opportunity to collect leadership and talent management data, real-time, for organizations dealing with a crisis. The Deloitte study showed that companies using the recession as an excuse to ignore the fundamentals of employee development — and cease efforts to nurture a new generation of star talent — did so at their own peril. 335 top executives and talent managers surveyed from the America, Asia Pacific, Europe, the Middle East, and Africa at firms with more than $500 million in annual sales. Though the survey shows the priority remains managing costs and making cutbacks, three of four managers thought leadership development was either critically important (27%) or very important (45%). The cold water: 31% rank reducing employee headcount as the highest priority. Jeff Schwartz, global leader for Deloitte Consulting’s Organization and Change service line, and who I was fortunate to have as a boss while I was at Deloitte, presented some of the study’s details at the Wharton Leadership Conference. 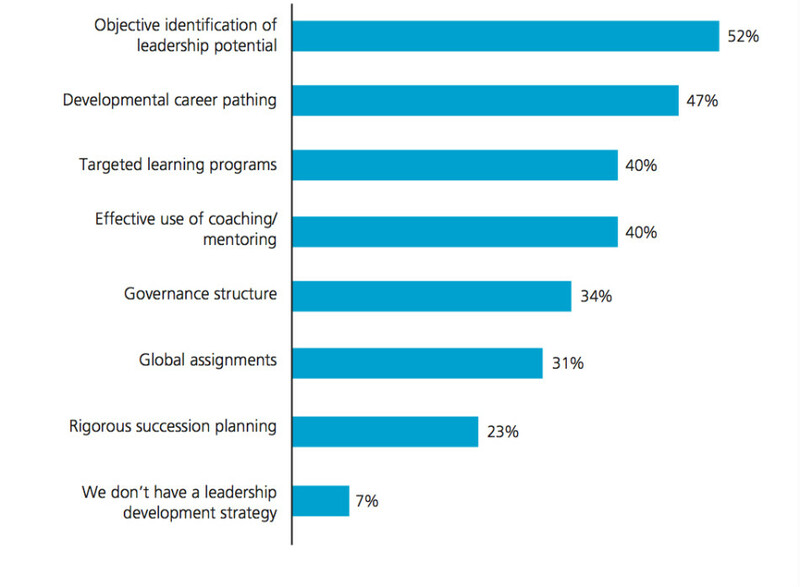 We didn’t expect to have a majority of respondents say that they were world-class at [leadership development], but we expected that … more than one in 10 would have [thought they were] really good at it, Schwartz noted. Everybody’s talking the talk but even by their own admission, not everybody is walking the walk. The 10% of companies that considered themselves leadership-oriented stood out because “they were less focused on layoffs and they were not bound to a weak economy. They were continuing to invest in training and development,” he said. Companies that anticipate no layoffs over the next quarter have a different view of the world—and their employees have a different view of them. Broadly speaking, these companies have a more optimistic view of the future, are having an easier time holding on to high-potential employees, and are investing more heavily in leadership development. Companies heavily invested in leadership development—particularly those with “world-class” leader- ship programs—act andoperate differently than their competitors. While many other companies are still focused on cutting headcount and managing costs, these organizations are effectively opening new career paths to their top performers and cherry-picking the best talent available in the marketplace. Overall, companies that reported no layoffs over the last three months appear more confident that their workforces have been right-sized for the new economy. By a 60-point margin (76% to 16%), the executives from these companies foresee no need for layoffs over the next quarter. Of those companies that did experience layoffs, however, 65% expect more layoffs to come. Overall, companies that do not anticipate making additional layoffs in the next three months are better able to keep top talent. Just 18% of executives at surveyed companies expecting no additional layoffs have seen increases in voluntary turnover among high-potential employees compared to 31% of executives at companies predicting future layoffs. Investing in talent during trying times is a way to assure important talent remains. Talent presents a human capital risk that is the real risk to a firm’s value. Faith in leadership, motivation, and improved performance are real impact for the most successful and sustainable global businesses. Talent investment comes is a competitive marketing and operating advantage over your competition. What is distinct is the cost of culture and those that pay attention to the return on talent investment show real results. I would like to believe that the insights you have mentioned here are all applicable and practical. This brings me back to the time when the great recession took place several decades before, and it was also during that time that Ford went against the tide, instead of firing employees massively, it went out of its way to help steer the economy back to its feet by providing job opportunities. I present things I witness, was part of, or through research. If the majority of companies or HR departments have this philiosophy or even try these strategies or methods is less relevant, to me, than they could try the strategy. A great talent management program, by any measure, will not cure a bad business model. A poor talent management program, however, does impact the ability to execute and deliver what is possible and what could be done better. Knowledge, ability, and skills are only factored and sustained by employee motivation. I wrote a blog on motivation management being the real key to resource management. Where financial or temporal resources are managed with greate, motivation should be viewed as a finite resource looked to get topped off more frequently and more diligently than time or money. Another view: how innovation and employee hygiene impact an organization’s ability to become and to stay great. Only through the continued motivation of employees. Thank you for the comment and reading the post, Michael. I welcome your ruther insights. Your thoughts on Ford are important. What was the positive (bottom-line) to what Ford did? What were the better take-aways from the Ford example: business model diconnect, poorly executed, culture disconnect?